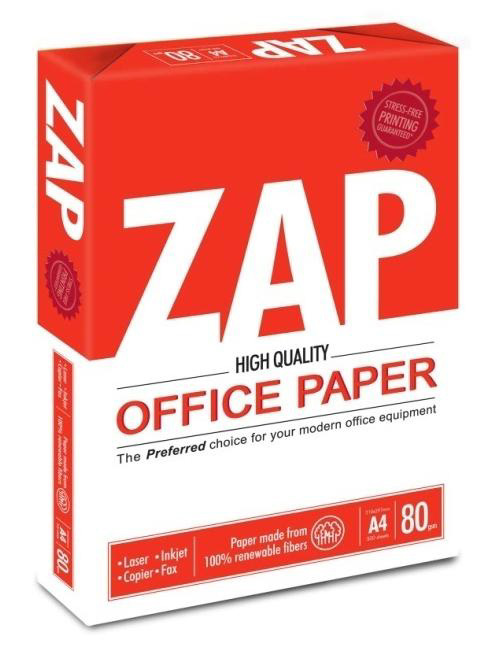 ZAP is a high-quality, reliable copy paper for everyday use. ZAP is specially adapted for printing in machines using the xerographic principle. It is developed for high-speed and problem free usage in printers & copiers. ZAP is made to give the highest possible reproduction and function in electrostatic dry toner printing (xerography) in both simplex and duplex printing. ZAP is produced from Elemental Chlorine free (ECF) renewable plantation fibers. Its environmental credentials include LEI, ISO14001 and in principles to international sustainable forestry management practices. PCC pigment technology improves smoothness, thickness and opacity while reducing wood-fiber usage. The paper is alkaline sized to meet ISO 9706 for archival quality. 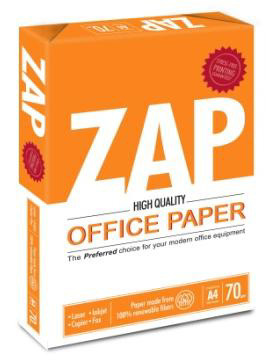 ZAP is produced at APRIL’s Riaupaper mill in Sumatra, which is ISO9001 and OHSAS18001 certified.